Some people are under the impression that a plant-based diet is boring and comprised primarily of salads. This could not be more inaccurate. 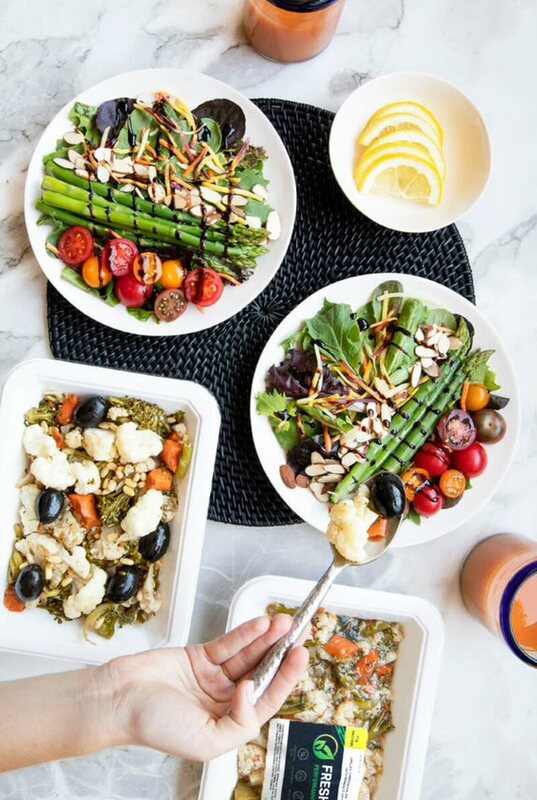 In fact, the dishes we prepare for our healthy meal delivery service in Oklahoma City are made with natural ingredients and so flavorful that we don’t have to wake up the food with added salt or oil. Our chefs make meals inspired by a variety of culinary styles. This is probably some of the most exciting food you will ever eat, and you don’t have to do anything to enjoy it besides pop it in the microwave. Every week, you will get a menu before you receive your prepared food delivery in OKC, so you already know what you can look forward to eating for the week. Want an easier way to keep up with your healthy eating program? Fresh n’ Lean has your answer. Our healthy meal prep delivery service in Oklahoma City is personalized to meet your own unique nutrition needs, giving you the strength you want consistently. Whether your ultimate goal is to drop some weight, improve your overall health, or build lean muscle mass, whenever you fuel your body right, achieving your goal becomes that much easier. If you lead a hectic lifestyle, our prepared food delivery service in OKC will take away meal preparation stress. Simply take your prepared meals with you anywhere you go and you’ll have a nutrition meal available in seconds. Enjoy delicious, nutritious, healthy and freshly prepared meals delivered to your home anywhere in OKC. If you’re dealing with a health issue such as high blood pressure, eating right has never been more essential and with Fresh n’ Lean healthy meal prep service in Oklahoma City, Oklahoma you’ll never go wrong. Whenever you put premium quality nutrients into your body, you’ll work to decrease your chance of disease and keep yourself feeling energized and in optimal health. At Fresh n’ Lean, we pride ourselves on preparing meals that cater to just about any individual. Managing your blood sugar levels are important, not only for weight control but also to help keep your level of energy steady. With each of our meals, you’ll have energy for several hours. All of our meals are cooked to perfection, full of flavorful ingredients that give you the perfect amount of carbohydrates, proteins, and fats.